In the United States...there are an estimated 25 million cloud to ground lightning flashes each year and each one is a potential threat to life and property. 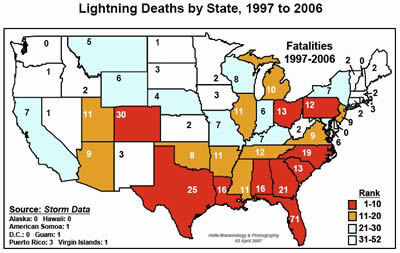 During the past 10 years there has been an annual average of 44 lightning fatalities in the United States. Colorado is ranked # 2 in lightning related deaths (1997 - 2006) so the danger this presents to life and property is very significant for us. It is interesting to note though that Colorado ranks only 31st in the number of cloud to ground strikes over that same period. This highlights the fact that, quite frankly, folks here in Colorado are not properly aware of the dangers lightning presents and they simply do not take proper steps to protect themselves. If you can see it or hear it, lightning can hit you. Find shelter now. Lightning is the number two weather killer in the United States (behind floods). Lightning kills about 60 people in the U.S. each year and inflicts severe life-long debilitating injuries on at least a 1,000 people a year. During 2006, 5 people were killed and 15 were injured by lightning in Colorado. In an average year in Colorado, 3 people are killed and 13 are injured. Every 5 seconds between flash and boom is a mile's distance from you. Under ideal conditions, lightning's thunder can be heard 12 miles away. Lightning is really no wider than a few inches. “Bolts from the Blue” - These lightning flashes have been documented to travel more than 25 miles away from the thunderstorm cloud. Clear skies above you are no indication of how dangerous a nearby storm is! The air within a lightning strike can reach 50,000 degrees Fahrenheit. Lightning can heat its path five times hotter than the surface of the sun. 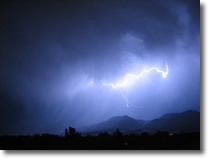 One ground lightning stroke can generate between 100 million and 1 billion volts of electricity. The “30-30 Rule” offers easy to follow lightning safety guidance. When you see lightning, count the time until you hear thunder. If that time is 30 seconds or less, the thunderstorm is close enough to be dangerous. Seek shelter. If you can't see the lightning, just hearing the thunder is a good back-up rule. Wait at least 30 minutes after the lightning flash before leaving shelter. No place OUTSIDE is safe during a thunderstorm! A house, or other fully enclosed building with wiring and plumbing offers your best protection against lightning. Once inside stay away off telephones, computers and other electrical appliances and stay away from sinks, showers, indoor pools and other plumbing. Don't watch lightning from windows or doorways. Inner rooms are safer. A car with a metal roof and sides is your second best protection against lightning. As in a house, don't touch any conducting paths leading outside. It is the metal shell that protects you, not the rubber tires. Lightning is the #2 weather killer in the United States over a 30-year period, killing more than hurricanes and tornadoes combined! Only floods kill more. Long-term lightning symptoms are primarily neurological and are difficult to diagnose. Though very variable, some of the more frequent symptoms include memory deficit, sleep disturbance, chronic pain, dizziness, and chronic pain. Lightning survivors sometimes have trouble processing information, are easily distracted, and have personality changes. Symptoms may not appear until months after the lightning strike. 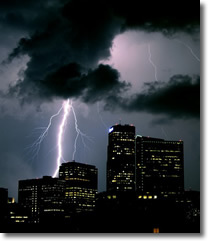 Lightning causes about $5 billion of economic impact in the U.S. each year! The odds of an individual being a lightning casualty in a year in the U.S. is about 280,000-to-1. If you're an average person, in an average location, with average outside activities, and average lightning safety behavior. That's about 3,000-to-one over your lifetime, with about 300-to-one odds of being seriously affected by a family member or friend being a lightning survivor. The odds of an individual being killed by lightning each year in the U.S. is about 3 million-to-1, if you're an average person, in an average location, with average outside activities, and average lightning safety behavior. That's about 35,000-to-one over a life time, and about 3,000-to-one of being seriously affected by a family member or friend being killed by lightning. TRUTH: Lightning often strikes the same place repeatedly, especially if it’s a tall pointy isolated object. The Empire State Building used to be used as a lightning laboratory, since it is hit nearly 25 times a year. Places prone to lightning are places to avoid when thunderstorms are nearby! TRUTH: Lightning often strikes more than three miles from the thunderstorm, far outside the rain or even thunderstorm cloud. ‘Bolts From The Blue’, though infrequent, can strike 10-15 Miles from the thunderstorm. Anvil lightning can strike the ground over 50 Miles from the thunderstorm, under extreme conditions. Lightning in clouds has traveled over 100 miles from the thunderstorm. TRUTH: Lightning laughs at two inches of rubber! Most cars are reasonably safe from lightning. But it’s the metal roof and metal sides that protect you, not the rubber tires. Thus convertibles, motorcycles, bicycles, open shelled outdoor recreational vehicles, and cars with plastic or fiberglass shells offer no lightning protection. Likewise, farm and construction vehicles with open cockpits offer no lightning protection. But closed cockpits with metal roof and sides are safer than going outside. And don’t even ask about sneakers! TRUTH: The human body doesn’t store electricity. It is perfectly safe to touch a lightning victim to give them first aid. This is the most chilling of lightning myths. Imagine someone dying needlessly, for want of simple CPR or mouth-to-mouth resuscitation, when their chances of survival was ~90%! TRUTH: Being underneath trees is the second leading activity for lightning casualties – enough said?! TRUTH: While a house is a good place for lightning safety, just going inside isn’t enough. You must avoid any conducting path leading outside, such as corded telephones, electrical appliances, wires, TV cables, plumbing (including plastic pipes with water in them), metal doors or window frames, etc. Don’t stand near a window to watch the lightning. An inside room is generally best. TRUTH: Sports is the activity with the fastest rising rate of lightning casualties. No game is worth death or life-long severe injury. All people associated with sports should have a lightning safety plan and stick to it strictly. Seek proper shelter immediately when lightning threatens. Adults are responsible for the safety of children! doesn’t attract lightning, touching or being near long metal objects (fences, railings, bleachers, vehicles, etc.) is still unsafe when thunderstorms are nearby. If lightning does happen to hit it, the metal can conduct the electricity a long distance (even over 100 yards) and still electrocute you. TRUTH: This advice is decades out of date. Better advice is to use the ‘Lightning Crouch’: put your feet together, squat low, tuck your head, and cover your ears. Lightning induces electric currents along the top of the ground that can be deadly over 100 Feet away. While lying flat on the ground gets you as low as possible, which is good, it increases your chance of being hit by a ground current, which is bad. The best combination of being low and touching the ground as little as possible is the ‘Lightning Crouch’. But the ‘Lightning Crouch’ should be used only as a last resort. Much better would be to plan outdoor activities around the weather to avoid thunderstorm exposure and to have proper shelter available. TRUTH: The “cone of protection” is a myth! While tall pointy isolated objects are statistically more likely to be struck by lightning, it’s not nearly reliable enough to rely on for safety. Lightning can still strike you near the tall object. Besides, the lightning electricity will likely spread out along the surface of the ground and can still kill you over 100 Ft from the “protecting” object. Also, if you are close to or touching the tall object, you can be electrocuted via side flash or contact voltage. NO PLACE OUTSIDE IS SAFE NEAR A THUNDERSTORM!